Researchers of Peter the Great St. Petersburg Polytechnic University (SPbPU) have developed a unique device for complex water purification that can improve or, in some cases, replace disinfection with chlorine. The researchers report an electrolysis unit producing an innovative reagent of sodium ferrate. Researcher Ani Petkova explained that sodium ferrate is capable of decomposing many toxic chemicals into less toxic products and destroying microorganisms, providing the disinfectant effect. According to the researchers, unlike chlorine, the new reagent does not form toxic substances in the process of water purification. Scientists believe that the equipment will significantly reduce the cost of water treatment processes. "To disinfect one liter of drinking water in summer, only 0.5 grams of sodium ferrate is required, compared with 4.5 grams of chlorine. In the cold season, 0.2 grams of ferrate are needed, compared with two grams of chlorine," said Petkova. She added that the necessary dose of reagent is reduced approximately to 10 times. The equipment can be used both for the drinking water preparation and for disinfection of industrial and domestic wastewater. "The water drained into natural water reservoirs can't be treated with chlorine, as it has a long-term effects and forms toxic compounds while interacting with organic matter in rivers and water reservoirs. There is no such problem with ferrate, as it reacts quickly and decomposes to non-toxic products, which allows draining the treated water into natural water reservoirs," Petkova said. Tests conducted by SPbPU scientists also demonstrated that ferrate can neutralize chlorine in the water. 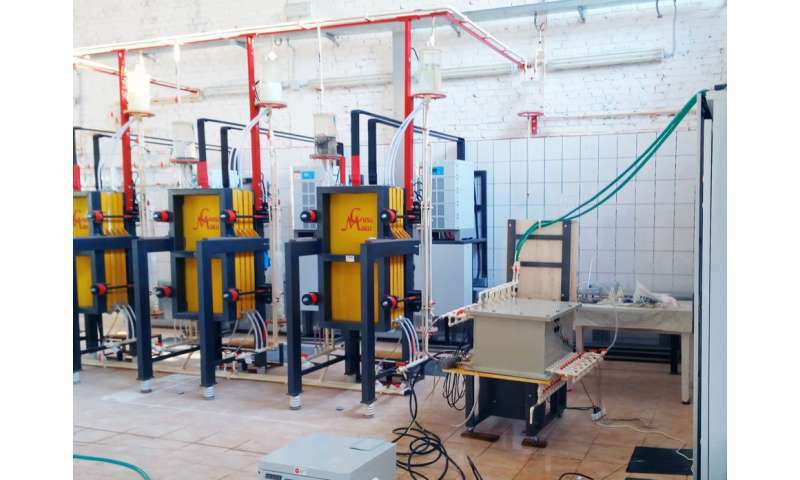 The researchers conducted tests at the hazardous waste landfill Krasny Bor (Leningrad region). The results showed that sodium ferrate is able to cope with serious contaminants such as oil products and their derivatives, nitrogen, phosphorus, sulfur-containing substances, cyanides, ammonia, heavy metals and other pollutants in industrial wastewater and reservoirs. Scientists believe that the equipment can be useful in countries with developed sewage systems, as well as regions requiring local treatment of drinking and wastewater. "It seems that China may be interested in this technology. Chinese experts are studying the disinfecting properties of sodium ferrate," said Petkova. "The reason is periodic unpleasant odor in the coastal areas, where salt water is used for domestic purposes. It enters the drains and causes the release of sulfur-containing substances. The use of sodium ferrate can possibly solve this problem," the scientist added. She also noted that the reagent can be useful in emergency situations in which water supplies are cut off. "For such situations, a mobile unit can be developed that produces a ferrate at the site," the researcher said.